NES Ninja Crusaders (USA) in 04:08.45 by AnS & Randil. The story is about a mysterious robotic force which attacked the world and drove the ninjas out of Japan. 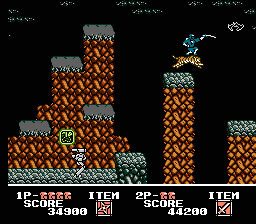 Two of the ninjas set out to reclaim the land, but not only did they abuse the powers given by the ninja-obsessed video game industry, they did it in style. The teamwork of the two ninjas is remarkable. One of the ninjas often transforms into a tiger on which the other ninja can ride.